Help ‘Strike Out Brain Tumours’ with the Toronto Blue Jays! 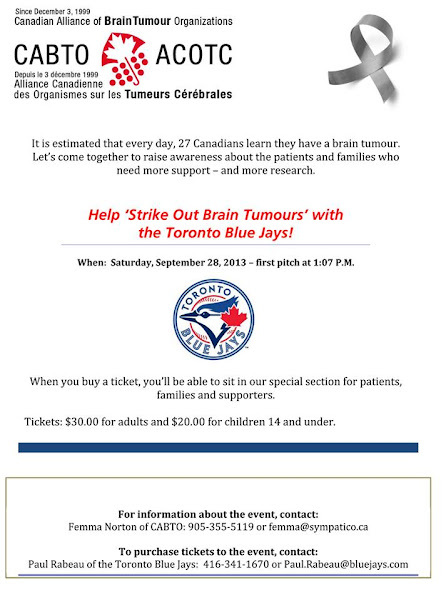 Over the years, CABTO has worked with the Toronto Blue Jays to bring together the brain tumour community at a fall baseball game raising awareness and funds for our efforts. This fun-filled day has created awareness about brain tumours as well as raised funds to support our advocacy efforts. When: Saturday, September 28, 2013 – first pitch at 1:07 P.M. When you buy a ticket, you’ll be able to sit in CABTO’s special section for patients, families and supporters. Tickets: $30.00 for adults and $20.00 for children 14 and under. Check out the poster for contact details.